Go easy with that colour. The water colour paints that I have been experimenting with in my recent forays into the world of colour fall into three easily discernible groups. First there are those which come in small block form in a handy painting box. These are what you might call “classic” watercolours and although offering apparently quite vibrant yellows and reds, they are generally rather earthy in nature. The box I have here contains eighteen blocks, quite enough for most things. The second group are in liquid form, like toothpaste, and come in small tubes. My small collection of these covers some Payne’s Greys and some tinting greys of various hues. The third group are those Radiant Liquid Water Colours that look more like inks and come in small bottles with a pipette in the top. The first and second groups are reasonably easy to get along with although there are moments when certain paints do weird things when applied to certain papers. I’m yet to get to the bottom of that one. The third group, those radiant fellows, are where all the danger lies and one must approach them with some caution. Through their vibrancy they tempt you to get a bit over excited with their application. One finds oneself forever walking a fine line between creating an image with a lovely glow to it, and utterly overdoing it, ending up with a riot of colour that could almost make your eyes bleed. The “sketch” above, to me anyway, is one such moment when I stepped over that line. Thinking I’d go for a simple vegetative backdrop I piled on the colour like there was no tomorrow. Once I’d started I found I couldn’t stop myself. What was meant to be a rather subdued background ended up being furnished with nuclear powered bushes. The scan almost doesn’t do them justice and I had to go and do something else for a while rather than attempt a sky. It remains without said sky, the white mimicking the grey overcast look of a typical english day. It is stuck to the studio wall now, where it serves as a reminder to take it easy. I do like the way the bike turned out though, which is what the sketch was all about in the first place. I traced this drawing off on the light box a couple of times so that I could monitor more what I was doing through working on the same picture a number of times. Version 2 will feature in the next post. Finally, if you are reading this Larry, you can see that I’m using the pictures of your bike to inspire some images. The Honda CB750 is a handsome beast and serves as a great starting point for some future images. There is still work to be done but the process has started and you will be able to follow my progress here on the blog. 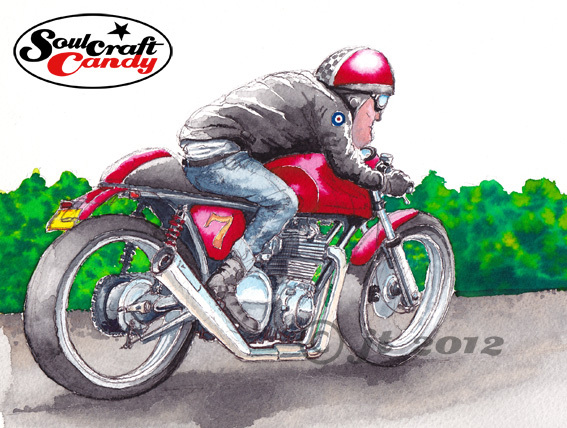 This entry was posted in Background, Bike drawing, Cafe Racers, Colour, Creativity, Drawing, Getting you eye in, Inspirations, Motorcycle drawings, Pop, Self-criticism, sketches, Watercolour and tagged Bike drawings, colour version, illustration, Motorcycle drawings, Sketching, watercolour by Soulcraftcandyman. Bookmark the permalink.